Join us in promoting flu vaccinations! Dually eligible beneficiaries should consider getting an annual flu vaccination. The following menu includes free educational materials for download for physicians, long-term care providers, local community organizations, and beneficiaries to promote flu vaccinations. The following flu education materials are available in the following languages: Amharic, Arabic, Armenian, Burmese, Cambodian, Chinese, Dzongkha, English, Farsi, Hmong, Karen, Kirundi, Korean, Japanese, Nepali, Oromo, Polish, Russian, Somali, Spanish, Tagalog, and Vietnamese. We are always seeking input to improve the materials hosted on this page. If you have local flu vaccination resources to add to the menu, please contact Lydia.Orth@cms.hhs.gov. Help Raise Awareness and #FightFlu this Season! On December 5 join the Centers for Medicare and Medicaid Services (CMS) on social media to promote flu vaccinations using the hashtags #FightFlu and #CalMediConnect! 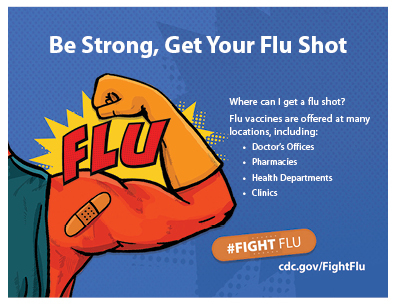 To encourage vaccination and emphasize the seriousness of flu, CMS is coordinating social media education and outreach with the Centers for Disease Control and Prevention during National Influenza Vaccination Week December 2-8. Please share the message that getting an annual flu vaccination is important for beneficiaries and their families, care providers, and community members. Amplify your organization’s commitment to combating this flu season by tweeting, blogging, and sending newsletters to your stakeholders! To get you started, draft language for tweets, posts, newsletters, and blogs are available for both provider audiences and advocate audiences. Please contact Lydia.Orth@cms.hhs.gov if you are interested in getting your organization involved. Below are resources for the general public, including beneficiaries, that promote flu vaccinations. Below are resources community organizations can use to promote flu vaccinations. Below are resources providers can use to promote flu vaccinations. Below are resources available in languages other than English.